It’s finally spring here in Michigan! We’re seeing buds on the trees and flowers blooming in our gardens. There are finally green shoots peeking up, promising new life. That’s what we love to celebrate in spring, isn’t it? New life! Spring is the year’s new beginning, everything starting again fresh and new. As believers we celebrate new and eternal life because of Easter. And yet, spring is also a time of remembering. We look forward to the new, but we also look back. We remember the cycle of the years, we remember what life means and what it brings, we remember our Lord’s body given and his blood poured out. Last week I was blessed to give this message as the devotional at a brunch. Our guest speaker was a professional photographer, giving us ideas and inspiration for beautifully capturing our family memories regardless of experience or equipment. I’m no pro, but I love to record memories visually, and I love to scrapbook the photos I take. I love to create something of beauty to enhance the photographs of our life, to look back at pictures of things that too easily fade without intentional remembrance. I see my daughter’s baby pictures and am surprised by details I’ve forgotten. Or I look at photos of my wedding day and remember again all the reasons I love my husband, and I thank God again that he brought us together. Remembrance is such a vital part of life. I believe it is crucial to living life to the full – something God desires for us! Jesus said, “The thief comes only to steal and kill and destroy; I have come that they may have life, and have it to the full.” (John 10:10). The English Standard Version translates “to the full” as “abundantly”. This isn’t just a “full life”; a full life is still empty when it’s filled up with busyness and spinning wheels. It’s life to the full; it’s abundant life! Webster defines “abundant” as “existing or occurring in large amounts: ample,” “marked by great plenty,” or “amply supplied: abounding”. God’s plan for humanity, implemented at Creation and redeemed though the Messiah, is for abundant life. Following any way other than God’s way is simply surviving. It’s a blink-of-the-eye, fading flower, withering grass, vapor-in-the-wind kind of life. But God offers us abundant life. And not just in eternity, but here on Earth! And again in chapter 6, vv. 1-12: “These are the commands, decrees and laws the Lord your God directed me to teach you to observe in the land that you are crossing the Jordan to possess, so that you, your children and their children after them may fear the Lord your God as long as you live by keeping all his decrees and commands that I give you, and so that you may enjoy long life. Hear, Israel, and be careful to obey so that it may go well with you and that you may increase greatly in a land flowing with milk and honey, just as the Lord, the God of your ancestors, promised you. “Hear, O Israel: The Lord our God, the Lord is one. Love the Lord your God with all your heart and with all your soul and with all your strength. These commandments that I give you today are to be on your hearts. Impress them on your children. Talk about them when you sit at home and when you walk along the road, when you lie down and when you get up. Tie them as symbols on your hands and bind them on your foreheads. Write them on the doorframes of your houses and on your gates. It applies just as much to us today: Christ as led us out of slavery to sin, and we are to obey and remember. Why remember? Because when we remember God’s commands, God’s way of life, we obey. It’s hard to do what is good and right when we forget what we’ve been told to do. So we are to remember, and we are to teach our children and their children to remember. 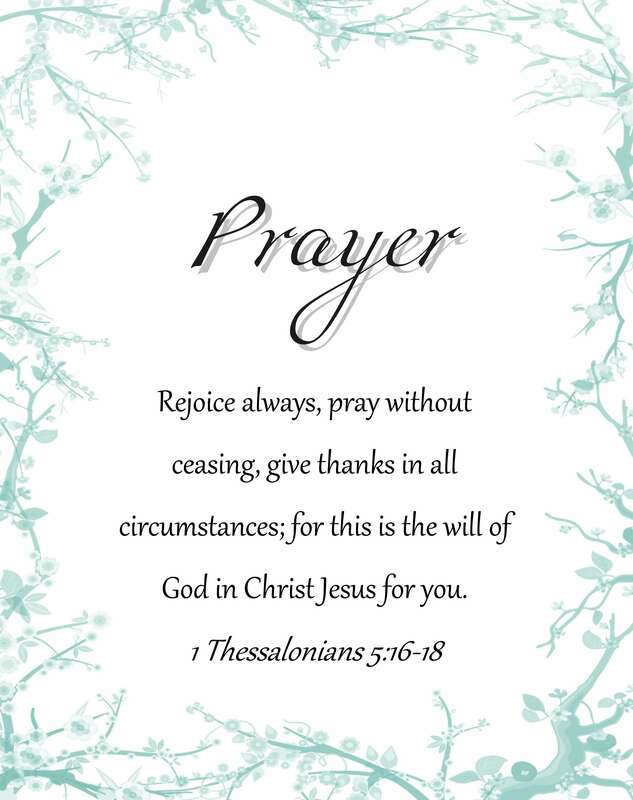 When we study Scripture, pray, praise and give thanks, we are remembering. We are filling up with the abundant life God has for us! We are honoring God’s command when we remember him by all the good gifts he gives us: what he has done in our lives, and the legacies left to us by those who came before. From the spiritual life lessons taught us by those who showed us Christ, to our grandmother’s love of life through gardening, to the old photograph’s of ancestors we never knew. I think it is so easy for us, women especially, to “forget to remember”. We cannot seem to grasp the abundant life because we fall prey to the Martha syndrome. We spin our wheels and get stuck in survival mode because we forget our true focus. Our brains are full day in and day out of All The Things. But Jesus said there is only one thing that matters: listening to him. Obviously, we all have God-given work to do. We cannot ignore daily life. But daily life done God’s way all falls under that one thing: listening to Jesus. We can call it obedience, following Christ, or living according to Scripture. But we can also call it “remembering”. 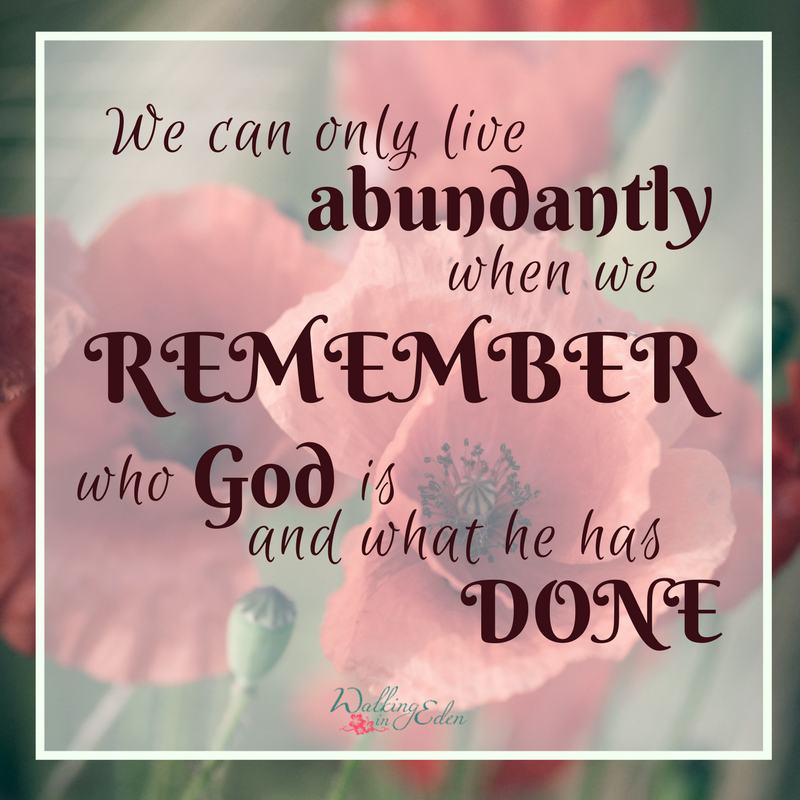 If we remember the Way of our Lord, we can have the abundant life God wants for each of us. We are his beautiful, precious children. He knows every hair on our heads, and he cares for every detail of our lives. Let’s remember it today. P.S. Some food for thought! Please share your thoughts in the comments! ~ Why does God want us to remember his commands? ~ What things of this life keep you from remembering what God has done and who he is? ~ What ways can you practice intentional remembrance in your life? ~ How can you be more like Mary in the midst of your Martha life?